The Cincom Smalltalk Digest is a monthly email update that encompasses our entire product line, news, updates and Smalltalk events all over the world. 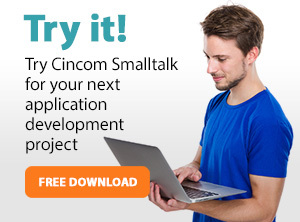 From common tools tutorials for the Cincom Smalltalk Foundation, to specific tutorials for both Cincom® ObjectStudio® and Cincom® VisualWorks®, we have a number of online tutorials to get you started with Cincom Smalltalk. Various talks and presentations gathered from our Cincom Smalltalk product team, partners and customers. Various video presentations gathered from our Cincom Smalltalk product team, partners and customers. Various books and media that teach Smalltalk and may benefit Cincom Smalltalk users. According to the results of the 2017 Stackoverflow Survey, only 13% of developers are actively looking for a job. However, over 75% of developers are interested in hearing and learning about new job opportunities. Check out some opportunities we are hearing about. Lists of all Smalltalk groups that meet around the world.